One of Britain's top scientists is joining the likes of Chris Tarrant and Nicole Kidman by putting her name to a new wave of computer games designed to keep the brain fit. As if the gym was not tyranny enough, now there's another fitness routine that's playing on the insecurities of the masses - the brain workout. Picasso aims to train visual memory. Users have a few seconds to memorise the right-hand design. After part of the design disappears, shapes are picked from the left to fill empty squares. The mouse is used to pick up one of the squares on the left, indicated here by its lighter shade. The chosen square is dropped into one of the empty squares. It is accepted if it is correct. The process is then repeated until the empty squares are correctly filled in as little time as possible. MindFit's creators compare this kind of brain exercise to a physical workout in the gym. A percentage score is given and can be stored for future comparison. But at least couch potatoes will not have to stir from the sofa to take part. This path to cerebral salvation can be navigated sitting down, in front of a screen, with a computer game. A current advertising campaign by Nintendo suggests commuters put their sedentary time to good effect by improving mind functions like memory and concentration with a brain game. The latest program to take the grey matter on a road test is MindFit, to be launched by one of Britain's best-known scientists, Baroness Susan Greenfield, on Thursday. Others include IQ Academy and Anagrammatic. MindFit is PC-based software providing a collection of games (such as Picasso, explained above) that its creators say can halt the mental decline associated with ageing, based on trials in Israel among 121 volunteers aged over 50. Bruce Robinson of MindWeaver, the company behind the software, says the different exercises target certain cognitive functions like memory, visual spatial awareness and concentration. "If you use the analogy of a fitness room or gym then it has the equivalent of all the machines to exercise this variety of functions and has an online personal trainer aligning the exercises that you do to match your particular abilities and match your own performance." Brain training is gaining popularity, Mr Robinson believes, partly because people are getting more interested in monitoring their wellness and brain health, and partly due to people living longer and dementia becoming more common in society. It is not just older people who are being targeted. The education system has long been aware of the potential use of computer games and a survey last year suggested about a third of teachers used gaming in the classroom, to sharpen motor and cognitive skills. Many brands have devised games that specifically aim to develop mental agility in people of all ages. Nintendo's Brain Training series, inspired by prominent Japanese neuroscientist Dr Ryuta Kawashima, has sold 10 million units - helped by endorsements from Chris Tarrant and Nicole Kidman. Olivia Doran, 69, from Hertfordshire, received one as a Mother's Day present in March. She spends about 45 minutes a day on a hand-held console playing brain games and Sudoku. "My 'brain age' was 75 when I started so that was a bit of a shock," she says. "But my average has come down to 27 now and I'm proud of that. It goes up and down. If you're tired when doing the exercises then your brain is a bit poor." The exercises Olivia does include arithmetic calculations, recalling four to six numbers in their correct sequence and working out the time difference between two clocks. Another involves drawing a design from memory. "In the beginning I wanted to do it because I wanted to make sure I stayed with it, but I do enjoy it too," she says. "I have noticed the difference to an extent. I can remember little snippets - things I hear on the radio - a little bit more accurately." Research done on animals has linked stimulation from visual tasks to the strengthening of neuron connections in the brain, says Professor David Moore, the neuroscientist who founded MindWeavers. Stronger connections between neurons have not been demonstrated directly in humans because a test would require putting an electrode into the brain, he says, but neuro-imaging of whole human brains shows activity in the same areas when people play these games. "When you do a difficult exercise on MindFit, what you're doing is engaging a population of neurons that are responding to what they see on screen or hear, and this population are all firing together in a synchronised way. That strengthens the connections with other neurons." This seems to prevent the onset of cognitive decline and could in the long-term provide an alternative to drugs, says Professor Moore. Daily life provides some of this stimulation anyway, he says, but the computer games record and assess an individual's performance, so can chart progress and keep the difficulty level at the right point. 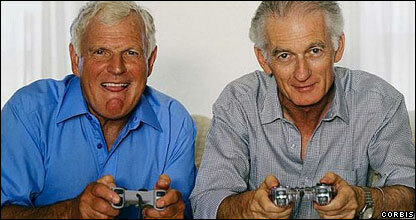 But not everyone is convinced that gaming is the best way to improve brain power. Ben Goldacre, who writes a column in the Guardian about the media's misrepresentation of science, says: "There's no doubt that maintaining and practising mental agility is protective in the long-term but there's a question about whether it needs to be a fancy and proprietary system. "People are trying to commercialise common sense and over-complicate it." These games are often no better or worse, he says, than doing a crossword, a Sudoku puzzle, a computer game or a sport that exercises hand-eye coordination. There's also a practical and more realistic reason to believe it won't be a craze that will sweep the nation. For those that find it hard enough to do 15 minutes of moderate exercise a day - and resent being told they should - taking the brain for a workout may remain a forlorn hope. My wife bought me a DS for my birthday that included the brain trainer game and after two weeks of day by day training we've both noticed an improvement in memory. Seems to be doing what the tin says it does! No disrespect to Olivia Doran, but on what theory do the game designers assert that her brain age has moved from 75 to 27? Are they not just replicating the observation that you can vastly improve your performance on IQ tests by doing more of them? Brain training may be a fad and it may not be, but the core of the matter is that the beneficial aspects of playing video games are finally being brought to the attention of a wider audience. Keeping the mind sharp is always a good thing, and video games add fun to the equation. To my surprise my girlfriend (who doesn't like computer games at all) got me into buying Big brain academy for the Wii and both play on a regular basis, although not daily. I have never bothered with regular fitness because it forces you to do boring exercises, but brain training is quite enjoyable and challenging. An interesting article. Mind you, I don't agree with the last paragraph. I would be much more likely to spend 15 minutes at the computer, especially on something like this, than I would be to go to the gym, or even take a long walk. These mind games lead to an intellectual cul-de-sac. They are probably a "here today, gone tomorrow" gimmick anyway, and may not even equate to a good crossword or codeword. The real brain stimulation which also has an extremely useful end product is language learning. Learning a foreign language stimulates the brain to the utmost. Furthermore, it is a social pastime unlike these mind games played in solitude. And what a high you experience when you find you can actually communicate in your chosen language. Games like Brain Age are a good idea. However, The tiny screen on the Nintendo DS makes it difficult for many older people, (such as those with vision loss), to use them. They should be offered on a platform that is more accessable to this group.